Wow! It can’t be September already! Where has the summer gone? It’s not surprising time has gone so fast as it’s been a super busy, in fact record breaking busy time for everyone at Torbay Holiday Helper’s Network, or THHN. We have hosted 67 families touched by serious illness or bereavement for very much needed free holidays in Torbay so far this year, one of whom were our 500th family! At the same time we’ve been busy organising our biggest fundraiser to date, all of which has led to an action packed summer that more people, fundraisers and volunteers have been a part of than ever before. We thank each and every one of you from the bottom of our hearts. The first City to Sea event has just taken place, here are some stories about why some people took part, more details about the event next month. 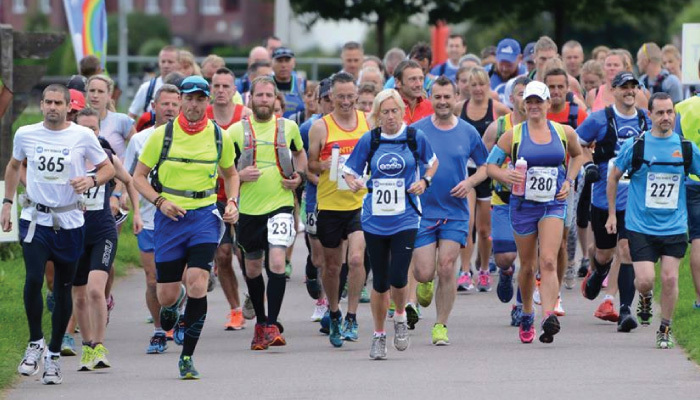 Sally Debney (41) was kind enough to share her inspirational story with us and also the Dartmouth Chronicle to help us raise awareness of the event and the work we do. Sally has had an especially busy summer holiday fitting long distance running around her usual activities as a mum, part time waitress and wife of the curate of Dartmouth Parish. Sadly, Sally lost her own son, Nathan, at just two years old in 2006, following complications after surgery for a bowel obstruction. However, Ann’s experience of her mother’s illness, and subsequent death, from Parkinson’s Disease and cancer made her aware that life is sometimes decided for us and families can be hit by tragedy in the form of illness or loss. You can show your support Ann’s City to Sea walk by donating to her Justgiving page. Peter lives in the North of the UK and has recently taken early retirement due to mental health issues (depression). He is enjoying my retirement and keeping myself busy but always looking for new challengers and ways of getting fit and losing weight. On August 23rd our running team flew the THHN flag proudly at the Torbay Regatta 10K. Among them was Lizzie Hurford who was taking part in her first ever race. Lizzie is part of the ‘THNN Slippers to Trainers group.’ The group was set up by THHN fundraising manager and runner, Brian Lewis, as a way to encourage people new to running to get started. “I’ve always wanted to be a runner and have regularly been at other events cheering the THHN runners in. My husband is a natural runner, completing many of the races with ease. I’ve always been the one holding the bags and waiting for him to finish. We went out a few times together but I never made it past the end of the road without being out of breath or telling myself I couldn’t do it. I’d always feel bad for slowing him down or shortening his runs! In January, I saw Brian posting about his ‘Slippers to Trainers Challenge. Being January, I was looking for a new resolution and hobby. I was nervous about going along to the first session but also very excited! Since then I haven’t looked back – each week I’ve made the effort to attend. THHN is close to my heart and that helps motivate me too. Running is something I can do and when I get tired I think of those people who can’t and try harder! I completed my first race, Torbay 10k on Saturday 23rd August, for THHN, after just eight months of running, 10k is pretty much a marathon to me so I picked my challenge and tackled it! I did the course in 1 hr 13, running consistent 12 minute miles. I hope it will be the first of many and if I can do it, anyone can! A new Slippers to Trainers group will be starting on September 17th so if you are feeling inspired to get running then why not join in. Keep your eyes peeled on the THHN facebook page for more information on how to join in. Lily and Poppy Barr have put their school holidays to very good use indeed in setting and achieving a fantastic cycling challenge for THHN. Lily, who is 8 and Poppy, aged 6, only started cycling at Easter. Having learned to ride at the Torbay Velopark, the girls decided to set themselves a challenge to go back there several times over the Summer and ride laps. Lily would cycle a total of 100 miles and Poppy would cycle 50. They reached their targets during their final session on Saturday 29th August and have raised lots of money for THHN in the process. Thank-you so much girls. You are amazing! If you’d like to add to Lily and Poppy’s sponsorship you can either text the message VELO87 £2 to the number 70070 or visit their Justgiving page. We would also like to thank Torbay Velopark for their support and for having our donation buckets available throughout the summer and of course to Lily and Poppy’s parents, family and friends who have supported them throughout their challenge. Another little girl who has put her summer to good use is seven-year-old Georgia Taylor who, with her super family, raised £217.90p for THHN, by holding their very own cake sale. We think we’ll be seeing you in that Bake Off tent with Mary Berry one day Georgia! Yet another child using his school holidays to challenge himself and raise money for THHN is Ollie Hill who has set out to run 30 miles through the summer. You can sponsor Ollie on his Justgiving page. Thank you the organisers of the Torbay Half Marathon, who have donated £500 to THHN, in return for our amazing volunteers helping to marshal the fantastic event! Of course a special thank you to our Team THHN volunteers for giving your much valued and appreciated time in order for us to receive this donation. A big thank you to Bishops Fleming Accountants in Torquay for choosing THHN as the charity to fundraise for in their latest challenge. A team made up of employees from all the offices will be cycling 325 miles between each office over four days. The Torquay Office held a Cycling Relay Race at Torbay’s Velopark this week, inviting teams from Pavey Group, Woolen Michlemore, Natwest and more to take part and to raise some sponsorship. A Great evening was had by all. A huge thank you to our super team of volunteers, who raised £262.19 at the Cockington Fair on August 5th. A big thank you to our good friends at Haddon Galleries, who hosted a fundraising event for us. Huge thanks to our wonderful partners who have donated holidays this month, including; Buckfast Abbey, Burlington Hotel, Vomero Holiday Apartments. Hotel De La Mer, The Cliffs Babbacombe Brunel Manor. Thank-you to our business partners who have donated food and goodies for our families on holiday, including; Riverford Home Delivery, Claire’s Cakes, Halletts the Bakers, Luscombes Butchers of Torbay, Westcountry Fruit Sales, The Entertainer Store, Torquay and Teddy Mountain UK Ltd – Stuff Your Own Teddy Bear. Huge thanks, as always, to the wonderful attractions and cafes across Torbay who donated visits to our families to help create a holiday of a lifetime. A special thank you too must go to our amazing team of volunteers who work so hard behind the scenes to make our very special holidays possible to give, to families affected by serious illness and bereavement from across the UK.